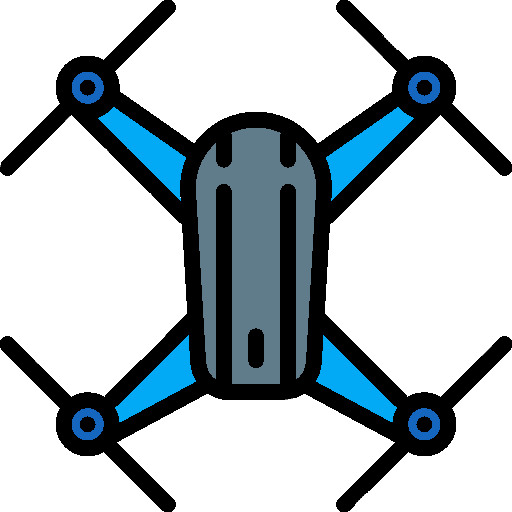 In this guide, we provide a solid drone knowledge base: the different types and categories of drones that exist, what drones are used for, and what to look out for when choosing a drone. Drones can be multi-rotor or fixed wing. 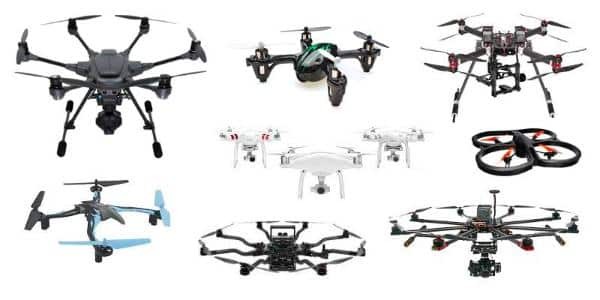 Multi-rotor drones can be broken down into the following: tricopter (3 rotors), quadcopter (4 rotors), hexacopter (6 rotors) and octocopter (8 rotors) drones. Drones, also known as unmanned aerial vehicles (UAV), come in many shapes and sizes and serve a growing number of purposes and industries. The popular consensus is that drones are unmanned flying aircraft controlled by a human drone pilot. However, this is no longer entirely true, as the technology has evolved for drones. The term now also encompasses underwater UAVs as well as drones that are autonomous and AI-powered, or even self-flying drones. There is also an increasing amount of terminology surrounding drones. Other names used for them include: remotely piloted aircraft (RPA), remotely operated aircraft (ROA), unmanned aircraft system (UAS), and unmanned aircraft (UA) to describe aircraft without a flight crew. From popular culture– with references such as the dystopian Black Mirror TV series and the “swarm of drone bees” episode– to the well-publicized military use of drones (mostly fixed-wing UAVs), we can see that drones profit an ever-expanding range of applications. Indeed, professionals and hobbyists have embraced this emerging technology in applications ranging from photography and video to inspection, racing, delivery, transportation, and more. The technological advancements of drones allow them to be quicker, bigger (or smaller! ), smarter (utilizing artificial intelligence), and to carry large payloads. and the multitude of roles that drones are able to fulfill. The price range of drones is huge, mainly due to the wide variety of drones available and the purposes they serve. Drone prices can vary anywhere from tens and hundreds of thousands of US dollars (high-tech military UAVs, surveillance and camera drones), to under 50 US dollars (micro selfie drones and toy drones). Aside from military-use drones which are not for commercial sale, the most expensive reported drone is the EHang 184, a sort of “flying taxi” concept drone from Chinese tech company EHang. The price for this large, autonomous, passenger-carrying quadcopter drone is $300,000. This drone is kitted out with air-conditioning, comfortable chairs, and a state-of-the-art control deck. In addition, this drone (dubbed an Autonomous Aerial Vehicle AAV by EHang) provides about 20 minutes of flying time and can reach speeds of over 62 mph (100 kmh). Ehang are also producing a 2-seater EHang 216, a hexacopter. The most expensive camera drone is the Augmented Aerigon Drone, priced at $250,000. This premium drone was custom-built by BRAINFARM in order to carry the Phantom Flex4K, a professional, high-speed camera for filmmaking. The cheapest drones can be found for under $20 USD. These are typically toy drones, however. Find the cheapest drone for photography, racing, underwater or other categories with our drone comparison engine. Drones can be divided into different categories: camera drones, racing drones, underwater drones, nano/mini/micro drones, and toy drones. 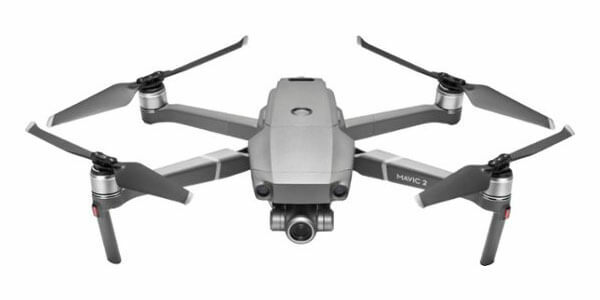 The DJI Mavic 2 Zoom is one of the best camera drones. Although camera/video drones is a broad category, it generally encompasses hobby and professional drones which are designed to capture amazing video footage and photos from the air. On the top end, professional drones feature 4K cameras, can be autonomous, as well as feature a range of advanced obstacle avoidance sensors. The flight duration and range vary, but 30 minutes is considered a great flying time, while the range can easily reach 7-10 km. These drones also feature a variety of video and camera modes to maximize the quality of footage and photos captured. Discover our hand-picked selection of the best 4K drones available on the market. The ARRIS X Speed 280 V2 is one of the best racing drones. Racing drones is possibly the biggest category of drones, and drone racing as a professional sport and hobby is increasingly popular. An FPV (first person view) racing drone is generally a small quadcopter drone or unmanned aerial vehicle (UAV) which is specifically designed for drone races; they are durable, light, and fast. When it comes to range and flying times, these drones are more limited than most other drones, but racing drones are faster than other drone types. See our article on the best racing drones for more information about FPV racing drones. 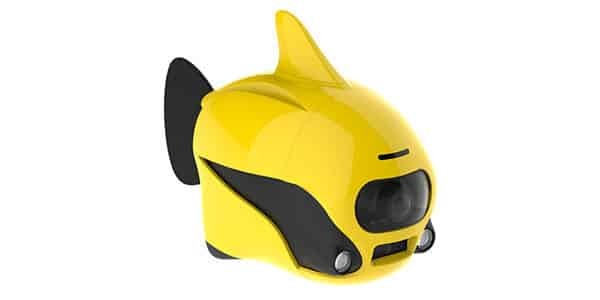 The Robosea BIKI is one of the best underwater drones on the market. This is a small but fast-growing category of drones, which also tend to be more expensive and are generally aimed at professional users. Professional applications include underwater surveillance and exploration or marine biology research. Underwater drones often require to be tethered to a cable, which is necessary for the live video feed. This limits the range but underwater drones can still reach depths of hundreds of meters. Such drones are typically equipped with good lighting in order to see underwater, as well as sensors for tracking and obstacle avoidance. In addition, the camera specs tend to be high to capture great quality footage in spite of challenging submarine environments. Use our comparison engine to see all available underwater drones. 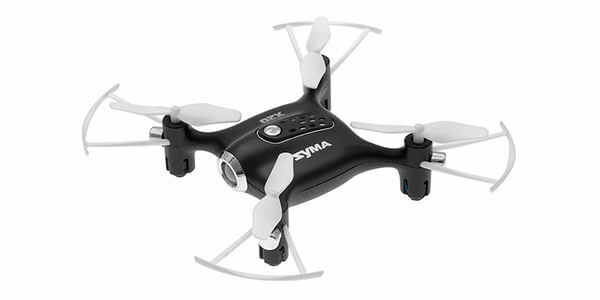 The Syma X20 is one of the smallest drones on the market. As their names suggest, nano, micro or mini-drones are small in size. These drones generally target beginners, although some nano drones are designed for professional or military applications. Moreover, these drones tend to be affordable and are ideally suited for indoor flying. 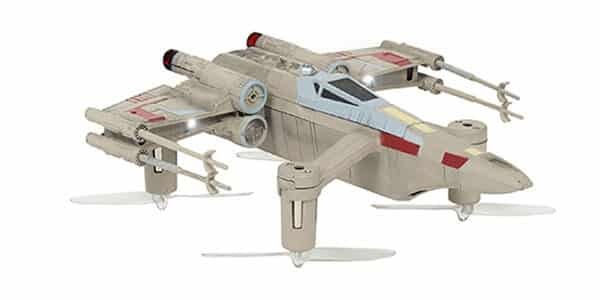 The Propel STAR WARS T-65 X-WING Starfighter is a toy quadcopter drone. These drones tend to be compact, easy to pilot, and available for a more affordable price. Not all toy drones are necessarily child-friendly but are suitable for beginners. These drones often feature built-in flight modes such as stunt mode (flip and roll) or selfie mode. Some toy drones even play sounds and simulated battle effects. See for example the Propel range of Star Wars drones. Hardware-wise and performance-wise, there are various elements to consider before choosing a drone. Drones are able to serve professional, commercial, and hobby purposes. However, they are mainly used for professional applications. Drones are mostly designed– or restricted– to fly for limited periods of time, although some tethered drones can fly for much longer periods. Racing drones and toy drones only offer 5 to 10 minutes of flying time while top-end commercial and camera drones can last between 30 and 45 minutes (or even longer). The maximum flight time impacts the amount of distance or range that the drone can cover. Other factors that can potentially affect the range include weather, battery life, and the transmission/signal power between the receiver and controller, among others. For the more affordable recreational and racing drones, the range is generally short (100-200 meters) while the larger and more expensive aerial (2 km) and long-distance drones (10 km) have a substantial range. 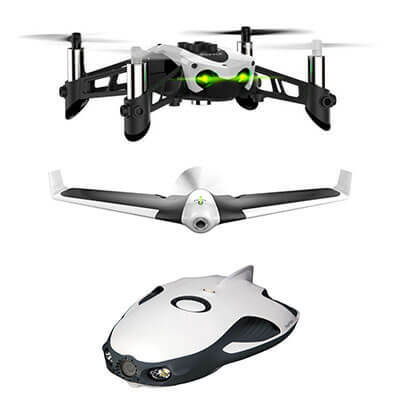 From top to bottom: Parrot Mambo multi-rotor drone, Parrot Disco fixed-wing drone, PowerVision PowerRay underwater drone. The Feihong-98 (top) and the SKEYE Nano 2 (bottom). Generally speaking, racing drones, micro/mini drones, and toy drones measure less than 30 cm in length and weigh around 500 grams or less. With the ongoing development of autonomous, delivery, and commercial drones, the size and weight of drones are increasing. Some drones now would be considered huge. 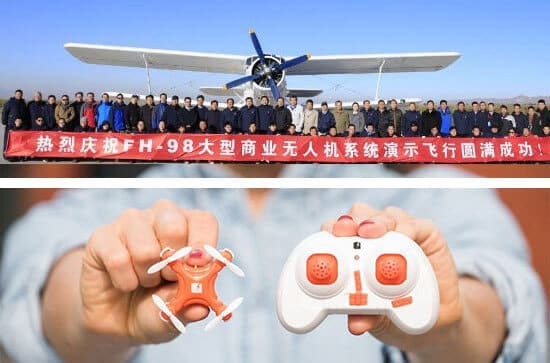 In 2018, China tested an unmanned transport drone, the Feihong-98 (FH-98), which can carry a payload of 1.5 tons and a takeoff weight of 5.25 tons! Boeing also tested the world’s largest prototype octocopter drone in 2018 which weighs 747 pounds (340 kg), is 15 feet long (4.5 meters) and 18 feet (5.5 meters) wide! On the flip side, the SKEYE Nano 2 Camera Drone is considered one of the smallest camera drones and measures only 4 cm diagonally and 2.2 cm high. In addition, it weighs only 11.9 grams. Drones generally need to be controlled by a drone pilot via a remote controller or RC (Radio Control) transmitter. These controllers tend to take the form of those you would see operating RC toys. The controllers allow the drone pilot to operate the UAV remotely and can come in variable shapes and sizes. In addition, they may come with or without LCD screens, and even smartphone and tablets can be mounted. Ideally, the controller should have a minimum of four channels. Furthermore, most drone controllers operate on a 2.4 GHz frequency. For a longer range, a controller with lower frequencies is required. RC transmitters can also operate via Wi-Fi. Lastly, in addition to checking a variety of other technical specifications, the drone pilot should ensure the controller is comfortable to use and ergonomic, with the buttons and control knobs easy to operate within their hands. 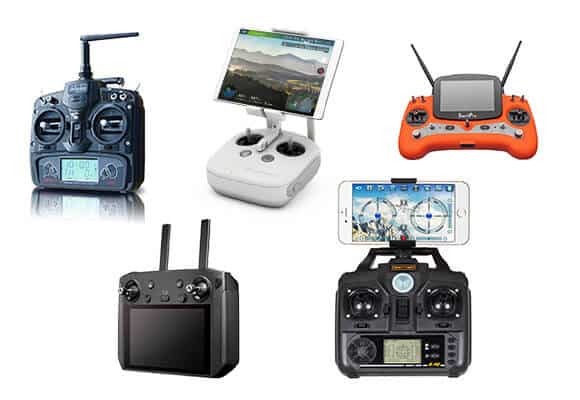 Different kinds of drone controllers. A drone’s maximum speed depends on various factors, including the drone’s weight, dimensions, and motor power, as well as weather conditions. Large professional drones and camera drones tend to reach speeds of 30-50 mph. These drones also tend to manage flights much better in poor weather conditions and have a long flying time and range. 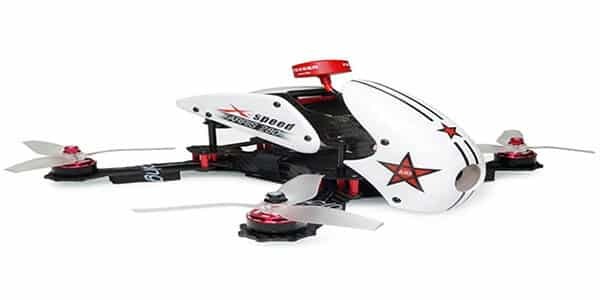 Some professional and lightweight racing drones are the fastest commercial drones available. RTF (Ready-To-Fly) racing drones can easily reach over 100 mph, but most other drones will max out at around 75 mph. The fastest recorded drone is the DRL RacerX which set the Guinness World Record for the fastest ground speed in 2017 at 163.5 miles per hour. The battery is very important for any drone. Users must take into account the battery’s capacity as well as the time it takes to fully charge. The length of time it takes to recharge a battery can vary but easily take up to 2 hours. Depending on the type and size of the drone, most drones would be considered portable. Toy, hobby, and racing drones, in particular, are compact and quite lightweight. They can also be modular in design, thus they are easy to disassemble. 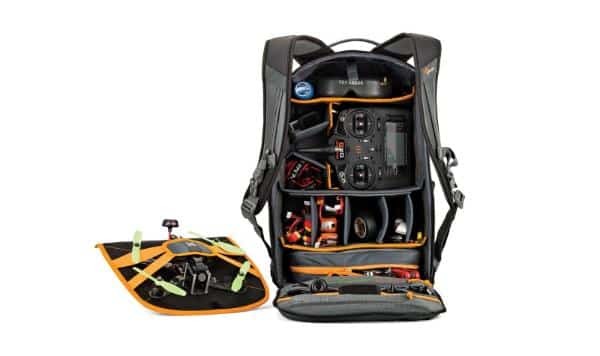 For more expensive camera drones, additional carry cases are more commonplace. Furthermore, some drones are foldable, meaning that the arms of the drone can be retracted. For high-end professional drones, every effort is made to make these drones easy to move and deploy in a short amount of time, as they may be needed for emergency situations or surveillance. There are exceptions, such as the UVify Draco 4×4 which has 16 rotors. Underwater drones also feature multiple thrusters which tend to be powerful to change the direction and assist in controlling the drone in strong underwater currents. UVify’s 16-rotor, the Draco 4×4. Waypoint: this function allows users to easily plot a course for the drone to follow. Orbit/POI (point of interest): with orbit mode, the UAV circles around a specific subject indicated by the user. The subject can, for example, be a person, a monument, a tower, a car, etc..
Return to home: usually, this is a one-touch function that returns the drone to its pilot or to a preset GPS location. Some drones automatically “return to home” when the battery is running low. 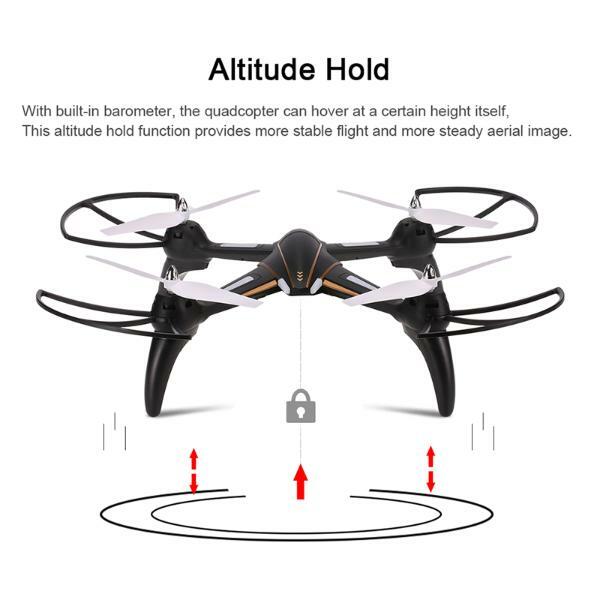 Altitude hold: this flying feature allows the drone to sit at a preset altitude and maintain its position. There are countless drone accessories available from specific manufacturers and generic drone suppliers. These include upgrades to drone components which most drones have, such as batteries, propellers, propeller guards, controllers, goggles, batteries, charging units, carry-cases, backpacks, memory cards, camera filters, etc. Online resellers such as Amazon, GearBest, AliExpress, and Banggood have hundreds of drone accessories available. DIY drones come delivered as kits to be assembled by the user, while RTF drones come ready to fly out of the box. Do-It-Yourself drones are popular for experienced drone pilots or tinkerers as they build their own drone (kit) by piecing together all of the drone components by themselves. 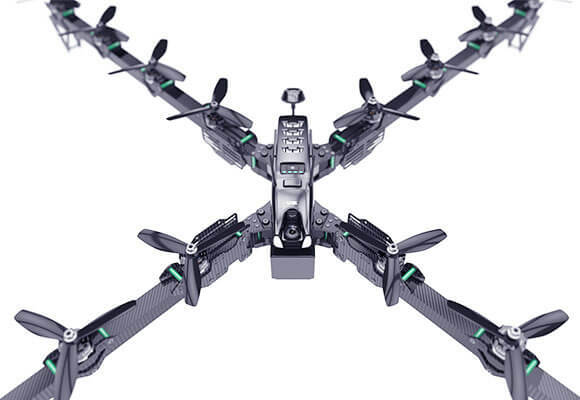 This includes purchasing separately the key components such as the drone frame, controller, battery, motors, ESC, camera, mounts, transmitters, and receiver. These custom builds are popular with elite-level drone racers to maximize the drone’s performance by hand-picking the best available parts from different manufacturers. However, for a DIY drone, the user needs to be careful to check the compatibility of the components. Below, we list the main types of drone kits. A BNF drone usually comes assembled. However, the user may need to purchase a controller and bind it to the drone, thus they will need to align the settings to enable the drone and controller to communicate with each other. Plug-N-Fly or Plug-N-Play drones generally exclude a receiver, transmitter, battery, and charger, thus these will need to be purchased separately and assembled. These drones may not come with a transmitter or receiver which will need to be purchased separately. In addition, some light assembly may be required. The manufacturer will usually make clear what additional components are needed separately, such as motors or a battery. RTF Ready-To-Fly drones usually are ideal for beginners to drones as the drone will require minimal assembly and setup. However, the drone pilot may need to complete some basic tasks such as charging the battery before their first drone flight. In addition, they might need to bind the controller to the drone or add the propellers. Generally, clear instructions for these tasks are provided by the manufacturer and/or there are online tutorials available. There are a variety of software and apps available for drones. Furthermore, the leading drone manufacturers offer proprietary apps that are optimized for their drones. DJI apps: this leading drone manufacturer offers bespoke software including DJI FlightHub (to manage the drone and its settings), DJI Flight Simulator (aimed at enterprise users) is Windows-based software which offers drone pilot training, and DJI GS Pro (an iPad app to control or plan automatic drone flights). In addition, the DJI GO app allows DJI drone users to capture and share content. 3D Robotics DroneKit: the software allows users to create drone-specific applications for mobile, web, and desktop platforms. There are also various excellent 3D mapping solutions for aerial drone mapping and photography. Some of these include Pix4D, DroneDeploy, and Precision Hawk. There are various categories of drones and methods to control them (controller, smartphone, FPV goggles, etc.) as well as in-flight modes which can make flying a drone easier for beginners. UAVcoach provides a detailed breakdown of the many detailed steps of how a drone pilot can fly a drone. 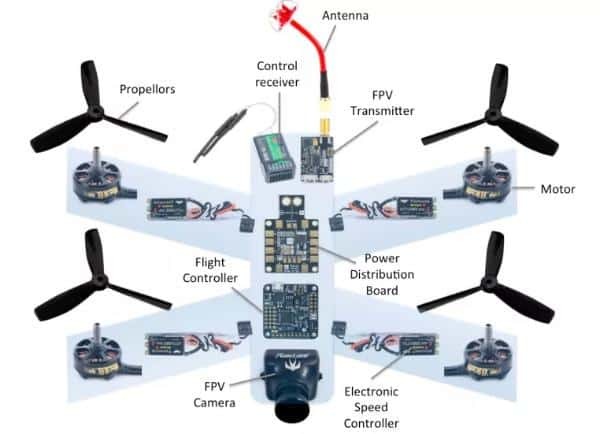 Ideally, a novice drone pilot would want an intuitive controller transmitter whereby they learn the basics of roll, pitch, yaw, and throttle to operate the drone safely. and restricting intrusiveness on flying over or near other people. Drones are increasingly easy to buy, being available in electronics stores, toy shops, brick and mortar specialists, and of course online resellers. These include popular e-commerce sellers such as Amazon, GearBest, AliExpress, and Banggood. Find out what is the best FPV racing drone.